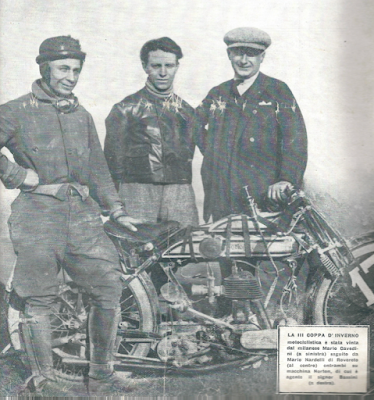 -JdK- Tino in Italy sent this cover photo from the March 1922 issue of "Lo Sport Illustrato". The rider (on the left) is Mario Cavedini, the Norton is a model 16H. Note the position of the oiltank, on top of the fueltank. This leads me to the view that these were perhaps special tanks made for the works and the Italian Norton agents were able to obtain one. I don't recall what happened to Eric's collection - perhaps someone will tell us - but the Squirrel Hotel was demolished around 2010 and new houses built on the site.